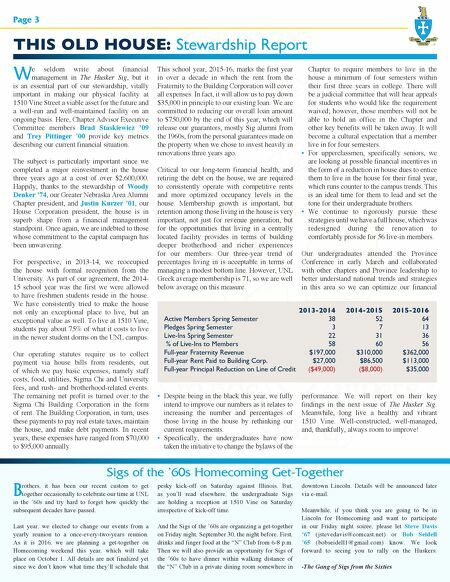 Alpha Epsilon Continues to Flourish (Continued from page 1) Page 2 which has steadily gotten more involvement from on-campus organizations and Sigma Chi alumni. This year, we added another promising philanthropy, where David Galloway Jr. '16 and Calen Griffin '18 teamed up with the Phi Mu Sorority on a fun event called "Chicken and Waffles". This food philanthropy raised nearly $6,000 for Children's Miracle Network and Huntsman Cancer Foundation. Importantly, we also gave back to the community with more than 500 hours of service via a number of local volunteer initiatives. Notably, this winter Ben Smith '18 led a major service event in which our Chapter helped run a children's event at Morrill Hall, and members are involved in Lincoln's People's City Mission. In addition to our great service, we also took the opportunity to meet the 2016 Miss Omaha and learn about her service and philanthropic contributions. Summarizing, I'm personally proud that philanthropy is taking firm root as part of our culture at 1510 Vine. Organizational Participation On a separate front, the executive team has worked closely on improving our communication within the Chapter. Our goal was to be more effective in managing our internal communications. Our executive team found the most important issues this year required addressing changing student attitudes about fraternity engagement. We have correspondingly changed our housing, academic, and judicial bylaws to reflect those attitudes. We adapted a new academic bylaw to emphasize membership retention and encourage academic excellence. We have also formalized a new requirement for a member to live in 1510 Vine Street for a longer period of time as a fundamental obligation to the Chapter. Finally, our judicial system has taken a giant stride under the leadership of Trevor Jorgenson '16 by creating a more personable and thorough strategy for arriving at judicial decisions within the fraternity. Sigma Chi hosts all Derby Days teams for Monday night dinner before the competitions start. Brotherhood Chairman Brendan "Lars" Larsen '19 makes pancakes on a Saturday morning in the sanctuary of our great kitchen. Husker Sigs conduct a short retreat to discuss "strategic visioning," setting the course for the Chapter's future direction. Members celebrate Christmas with a secret Santa get-together. Through these initiatives, the sense of commitment to one another has clearly grown, and our membership has become closer as we've developed activities to promote brotherhood. Brendan Larsen '19 has promoted events each week for each member of the fraternity to participate in, and also promoted more individually-focused member events to support one another on and off campus. For example, our group has been active on campus playing pick-up basketball or at University speaker events set up by Thien Chau '16 and Ky Veny '17, both of whom hold important student government offices on campus. We have also been involved in off-campus activities, such as supporting Jake Kawamotto '17 and Corey Oldenhaus '17 with their impressive musical performances. As I look at the Chapter's strategic goals, I would be remiss to overlook the individual efforts of our brothers to make Alpha Epsilon the best Greek fraternity on campus. I'm confident that the big and small things that our group of young Sig leaders has accomplished will win another Chapter Peterson Award this year. Each member has identified a personal developmental goal to strive for to build real leaders and a stronger Sigma Chi. I believe that Alpha Epsilon Chapter is in great hands for the upcoming year. In all, there remains an opportunity for previously uninvolved alumni and any members looking for a richer experience to enthusiastically get involved. 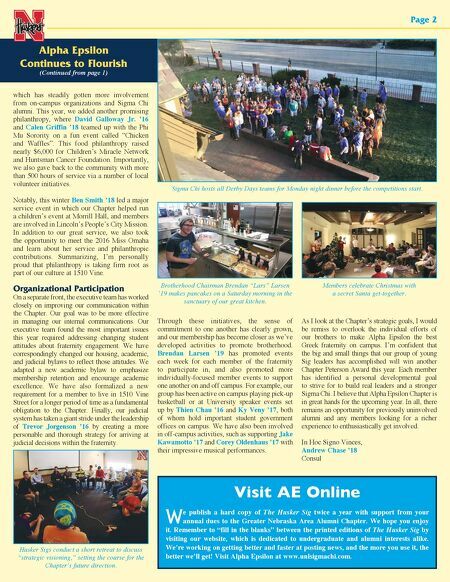 In Hoc Signo Vinces, Andrew Chase '18 Consul Visit AE Online W e publish a hard copy of The Husker Sig twice a year with support from your annual dues to the Greater Nebraska Area Alumni Chapter. We hope you enjoy it. Remember to "fill in the blanks" between the printed editions of The Husker Sig by visiting our website, which is dedicated to undergraduate and alumni interests alike. We're working on getting better and faster at posting news, and the more you use it, the better we'll get! Visit Alpha Epsilon at www.unlsigmachi.com.